Looks amazing, doesn't it? So much like real meat. Just kidding. 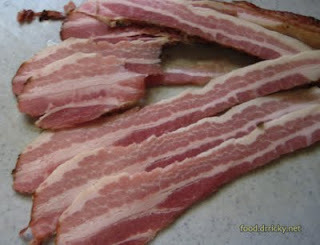 That's home cured bacon, sliced manually. Breakfast, anyone? That bacon looks familiar. Have I met that bacon? Or do you have a new supplier? Yes indeed, you've met that bacon. Actually, I took that picture a while back, just decided that I wanted to post it.